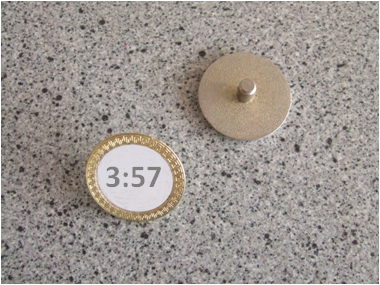 While playing in a semi-open team competition this week, one of my guests showed me a ball marker, as in the photo above, and asked me what I thought it meant. Having rejected my first thought that it might be a Biblical reference, I did suggest that it might be the optimal time for completing 18 holes of golf. I was on the right track, as his answer was that the marker was given to him when he played the Old Course at St. Andrews, as a reminder of the target time there for players to complete their round. The Old Course range balls are also printed with this pace rating, which was established with Bill Yates, an acknowledged expert on pace of play*. I don’t think that many of us would complain if our rounds of golf were regularly completed within four hours. Unfortunately, it seems that rounds are consistently taking longer and that on some courses five hours is more the norm. Of course, there are several factors that contribute to slow play but there is no doubt that player behaviour is one of the main causes. So, how can the Rules help in this respect? The severe penalty for not being ready to play at the allotted tee time in a competition is disqualification. This may seem harsh, but on a busy time sheet, a player arriving late can result in all the subsequent groups being delayed and finishing later than they otherwise would have done. In fact, a note to Rule 6-3 permits the Committee to introduce a Condition of Competition that if the player arrives at his starting point, ready to play, within five minutes after his starting time, in the absence of circumstances that warrant waiving the penalty of disqualification as provided in Rule 33-7, the penalty for failure to start on time is loss of the first hole in match play or two strokes at the first hole in stroke play instead of disqualification. However, in my experience, this Condition of Competition is rarely invoked. The penalty for the first offence of undue delay in stroke play is two strokes and in match play is loss of hole. For a subsequent offense the penalty is disqualification. Unfortunately, Committees rarely impose penalties for undue delay (slow play). On US tour events it has been 18 years since a PGA Tour player received a penalty for slow play, although players are now put ‘on the clock’ more often than was previously the case. This happens when a group is ‘out of position’, which is often defined as being at least one hole behind the group in front, but can be based on criteria set by the tournament's ruling body. Golfers who are ‘on the clock’ have their pace of play monitored and if they do not speed up their play they can be assessed the penalty of two strokes. Slow play is a problem that all golfers can and should play their part in improving. Apart from ensuring that we maintain the correct pace of play ourselves, (e.g. by walking quicker between strokes; assessing our next shot while another player is preparing for theirs; eliminating unnecessary, time-wasting elements of our stroke routine; and leaving our golf bags at the exit to the putting green) we can also encourage the other players in our group to do the same. A good principle is to try and keep close to the group in front, no matter what is happening to the group behind. * I recommend that anyone interested in ‘Pace of Play’ on their course reads the feature interview with Bill Yates at; http://golfclubatlas.com/feature-interview/interviewyates. P.S. A correspondent of mine from the Canadian Junior Golf Association has pointed out that the last time the Open Championship was played at St. Andrews, in 2005, the average time for a 2-ball was almost five hours! It will be interesting if they speed-up their play this year. In my opinion, there is no excuse for two professional golfers playing together to take five hours to complete their round. They play less strokes, they have a caddie to assist with yardages and carry their bags, and they hardly ever have to search for a ball because the spectators act as forecaddies. P.P.S. I understand that some of you that receive my blogs by email (you can subscribe for them at the top right-hand corner of my home page) may not have been able to open the video of Jeong Jang's double hit last week. If your email client will not permit you to play videos you can always go to my blog at http://www.barryrhodes.com to view them from there. This is mentioned the book "America! What Have You Done To The Auld Game" by W. Eric Lang, which is devoted slow play and what can be done to fix things. With pace of play being such a hugh problem, it's surprising that so few courses take effective actions to remedy the problem. Luckily, we a challenging daily fee course in the Kansas City area (www.thegolfclubofkansas.com) that's extremely dedicated to maintaining a reasonable pace of play. It seems that there are players who WANT a slower round of golf. They may be older, have to hit the ball more often, look for balls more. The main policy seems to be, force them to walk faster, keep up. We all know that they will not want to call others through - it just makes their own game slower and more frustrating. And it does not work - slow play is the No.1 complaint! So, why not zone up the 1st tee into, say 3 time zones. "Fast" (say 3h 15), "Medium" (3h 45) and "Slower" say 4 h 15. Then players have a choice. The day is not ruined for all because there was a blockage up front, hours ago. Players can still go through - just should be less of it, and happier golfers all round? The length of a round of golf. A tee time is specified and the round played, does shaking hands on the 18th mean the end of the round or is there a rule to say it is the time a card is entered into a recording computer. I am not sure where you are coming from with this question. Obviously, the time taken for a round of golf is from the time the players start teeing-off on the 1st tee (which may vary from the specified tee-time if there are unscheduled delays to the competition), to the time the players leave the 18th green. Rule 6-6b requires that the score card be signed by the player and marker and returned to the Committee as soon as possible. Regarding when a round is completed, various "slow play" rules that I've seen deem a hole completed when the flag is replaced. So the round could be complete when the flag on the last hole is replaced (assuming that certain slow play rules are being followed). The rules you speak of are not Rules of Golf. Usually, they are not even Conditions of Competition, but are attempts by course owners. managers to speed-up play. Players may not be penalised for not adhering to them, though the Club may impose their own sanctions (e.g suspension from future competitions).